The number of Indians arrested for illegally entering the United States has nearly tripled so far in 2018, making them one of the largest groups of illegal aliens apprehended, U.S. Customs and Border Protection (CBP) said on Friday. 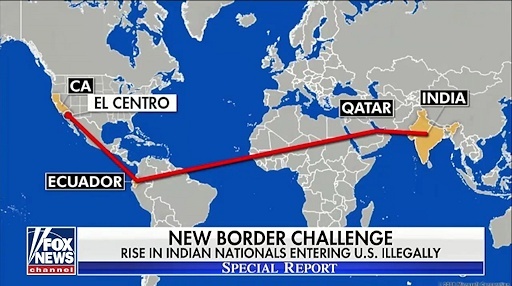 Paying smuggling rings between $25,000-$50,000 per person, a growing number of Indians are illegally crossing the U.S.-Mexico border and claiming asylum for persecution, CBP spokesman Salvador Zamora said. Many present viable claims, but a large number are economic migrants with fraudulent petitions that swamp the system and can cause legitimate cases to be "washed out" in the high volume of fraud, Zamora said in an interview. The Indian embassy in Washington and the Indian consulate in San Francisco did not respond to requests for comment. Zamora said the CBP expects that the data for the fiscal year that ends on Sept. 30 will show "around 9,000" Indian nationals had been apprehended versus 3,162 in fiscal year 2017.